A fun bright rhyming text book about comforters. 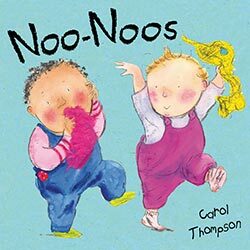 Beautifully illustrated book showing a huge assortment of noo-noos (comfort objects) and their young owners. Worth noting: One of the children featured in the illustrations has an eye patch and another has a hearing aid.